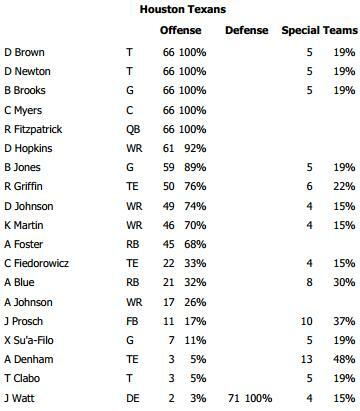 Here are the Texans offensive snap counts vs Jaguars in week 14. 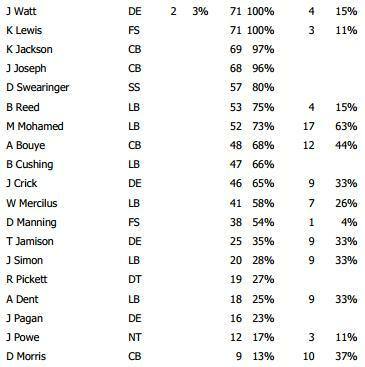 Here are the Texans defensive snap counts vs. Jaguars in week 14. – Just seven plays for rookie guard Xavier Su’a-Filo. He took slightly more than half the reps at guard a week ago splitting time with Ben Jones and played well. Just wasn’t used in this game. – With Garrett Graham inactive due t an ankle injury, Ryan Griffin got the majority of the work at tight end, he was in on 50 of the 66 offensive plays, while Fiedorowicz playing just 20 snaps. Griffin is clearly the pass-catching option, although with Fitzpatrick only throwing 19 passes, Griffin was targeted just once. He found himself wide open inide the five-yard line and had Fitzpatrick gotten the ball to him just a tad quicker, he probably would have scored following the 25-yard catch. He had to go to the ground to get it and being so open, he was nearly able to flip himself into the endzone before a Jaguar touched him down. Rookie tight end Anthony Denham made his NFL debut recording his first special teams tackle. He also lined up at wideout at least once during the game. – After Andre Johnson left the game with a concussion in the first half, Houston was left with just three active receivers, Hopkins who got 61 snaps, along with Damaris Johnson and Keshawn Martin, who each saw their most extended playing time. Johnson was in for 49 snaps, while Martin got 46. DeVier Posey has been healthy and inactive for all 13 games this season, that could change, finally, this week when the team is at the Colts. – Kareem Jackson returned to the lineup after missing the last three games with a knee injury and took all but two snaps. Johnathan Joseph also handled a full workload with 68 snaps. The third corner, somewhat surprisingly, continues to be clearly be A.J. Bouye, who played 48 snaps. Darryl Morris only got nine snaps and Jumal Rolle had zero snaps with the defense. 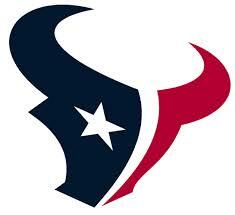 – No word on an injury, yet, with OLB Whitney Mercilus who saw 41 snaps in the game, although it appeared all of them came in the first half. He was on the sidelines, still in full uniform, during the second half. With Jadeveon Clowney out and soon to be on injured reserve, the Texans only remaining outside linebackers are Brooks Reed (53 snaps) and John Simon (20 snaps). – Five players were used exclusively on special teams: CB Jumal Rolle, SS Eddie Pleasant, LB Jeff Tarpinian, LB Justin Tuggle and RB Jonathan Grimes. Rolle had been playing very well as recently as last week, when he picked off his team-leading third pass, but got zero snaps defensively.